Along came a spider… The Black Spider Assisted Opening Pocket Knife is not only enticing but is also a great utility knife to have on you in an emergency. It features a razor sharp, serrated 440 black stainless steel blade. The sharp blade can be accessed quickly with the assisted opening mechanism. 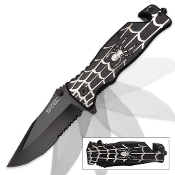 The black aluminum handle is laser-etched in white with an intricate spider and web design. An integrated seatbelt cutter and glass-breaker gives you the right tools that you just might need in an emergency situation.